I was fortunate to be in a terrific leadership development class this week held in coordination with University of Virginia, and one of the instructors shared this interesting explanation about the four levels of emotional intelligence (EI), which I have put into the attached graphic (note: there are other variants of this). 2. Self-Management: Being able to control negative displays of emotions, thoughts, and behaviors. 3. Self-Direction: Being able to positively choose emotions, thoughts, and behaviors. 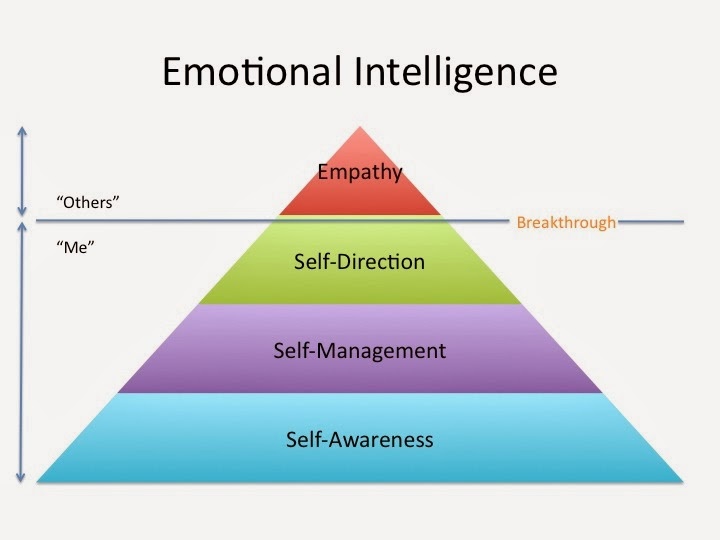 These three levels are steps and maturity in the development of a person’s emotional intelligence. 4. Empathy: Being able to understand, share, and identify with the emotions and thoughts of others. However, in order to get to the stage where we can genuinely connect and empathize with others, we must first work on ourselves. 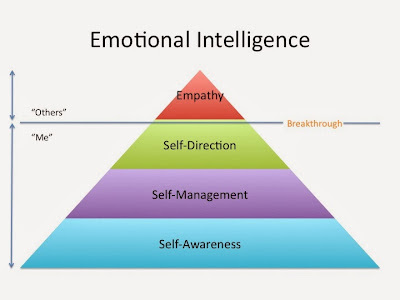 From a leadership perspective, I think this model of emotional intelligence is very valuable, because it provide us the framework for maturing our emotional self-development starting with basic awareness and advancing toward gaining control over ourselves and ultimately being able to have meaningful understanding for others. It is only with such understanding of and connection with others that we can create the foundation for successful teamwork, innovation, and improved performance. Where are we failing on EI? Being so busy with “the daily grind” that we don’t have the time, energy, or capacity to do justice to the relationships in our lives. Lack of mastery of the “me”—we lack self-awareness and are not in control of ourselves. Narcissism that leads us to ignore the others around us and therefore leads us to have difficulty relating to them. All of these, in a sense, represent a huge life paradox. We are taught that to succeed we must work on ourselves, and in turn we have become a self-focused society. We have learned that success means being perfectly educated, thin, fit, married, earning a huge salary, and so on. But we are so busy thinking about these goals and looking at them as pure achievements to be marked off on a list that we lose sight of the process. And in doing so we actually become less effective at the things we are trying to do. The process is about becoming emotionally intelligent—about learning the skills of self-control, self-management, self-direction, and ultimately empathy. In fact, to succeed—and to find meaning in that success—we must give meaningfully to others in time and energy, rather than just taking for ourselves. Ultimately, it doesn’t have to be a “breakthrough” event to empathize, give, and build healthy and productive relationships. Regardless of how much money or prestige we achieve in life, I believe that achieving the “us” rather than only focusing on the “me” is truly where the biggest payoff is at in life.